Islam Around Us: Iraq violence: Baghdad hit by series of deadly blasts. 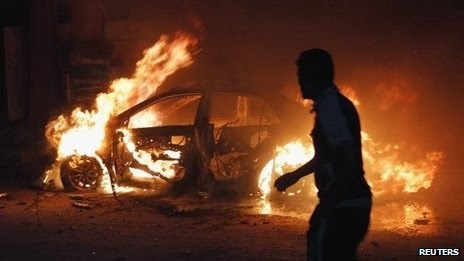 Iraq violence: Baghdad hit by series of deadly blasts. BBC News | 07 Oct 2013 :: At least 22 people have been killed and dozens hurt in a series of explosions across the Iraqi capital, police say. There are reports of at least six apparently co-ordinated bomb attacks in mainly commercial areas of Baghdad. The majority were reported in mainly Shia districts, but a predominantly Sunni Muslim neighbourhood was also hit, according to Reuters news agency. Iraq has seen a sharp rise in sectarian violence in recent months. Nearly 6,000 people have been killed this year. Two of the explosions were reported in Doura and in the Husseiniya district, where a parked car was reportedly blown up in a busy street during the evening rush hour. There was no immediate claim of responsibility.The rate of attacks has quadrupled since the relative calm in the months before US forces pulled out in 2011. Almost 1,000 were killed in Iraq during the past month alone, the UN has said, amid fears of a return to the sectarian conflict that peaked in 2008. Most of the violence has been blamed on Sunni Islamist militants linked to al-Qaeda in Iraq (AQI), which belongs to the over-arching Islamic State in Iraq and the Levant (ISIS). Iraq has also seen a spill-over of violence from the conflict in Syria, where jihadist rebels linked to the Islamic State of Iraq, a Sunni militant umbrella group that includes al-Qaeda, have risen to prominence. In the past two months, Iraqi security forces have reportedly arrested hundreds of alleged al-Qaeda members in and around Baghdad as part of a campaign the government is calling "Revenge for the Martyrs".